What’s that saying with lemons? “When life gives you lemons…decorate!” No, that’s not correct. Maybe it’s “when life gives you lemons, throw them back harder?” No, it wasn’t that either. It’s “when life gives you lemons, make lemonade.” Yeah, that’s it. Or, there’s, “easy peasy lemon squeezy.” How about, “when life gives you lemons, grab tequila and salt?” Yeah, we like that one! 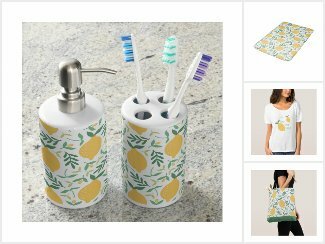 Well, no matter what you like to say about lemons, they are not only tasty but vibrant in color and a great way to decorate your home, office or self. Need some spring color and style in your life? Try any one of our lemon designs. How about using our lemon pattern wrapping paper as a liner inside your dresser drawers? Check out InMyOwnStyle.com’s blog post on how simple it is to do. How about styling your bathroom to have fun, light, vibrant colors…and, with matching accessories? We’ve got a shower curtain, bath towels, toothbrush holder and soap dispenser set, and even a bath mat. Or maybe, accessories yourself while on the go. Want that yummy, citrus lemon smell in your home? Add a drop or two of lemon essential oil to your towels or oil diffuser to make it feel like you’re walking in a field of lemon trees. We recommend NOW and use it ourselves sometimes in the office (it’s organic). If you need an oil diffuser, try the URPOWER waterless diffuser. *All Sparkle & Glitter products are customizable. If you need assistance or want a customized design, don’t hesitate to contact us. **Some links on this post are affiliate links, meaning, at no additional cost to you, we may earn a commision if you click through and make a purchase. However, any referrals we suggest are because we either use or trust the product/company completely.